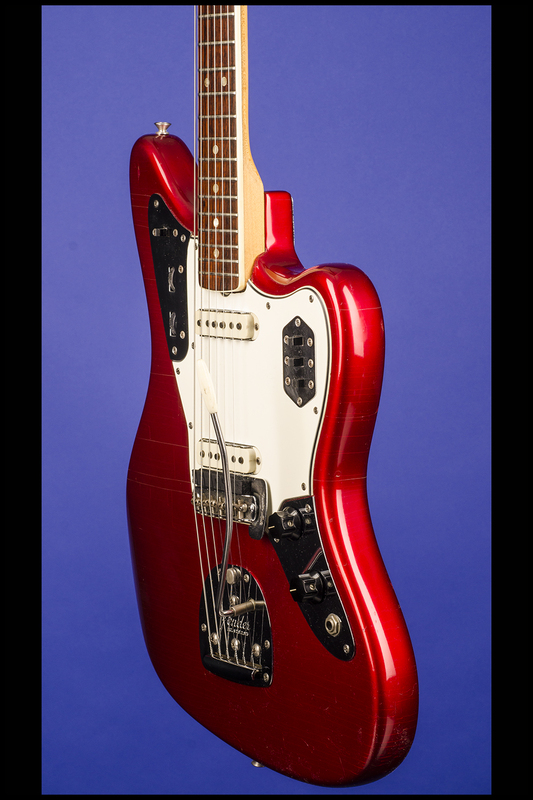 Jaguar Guitars | Fretted Americana Inc. 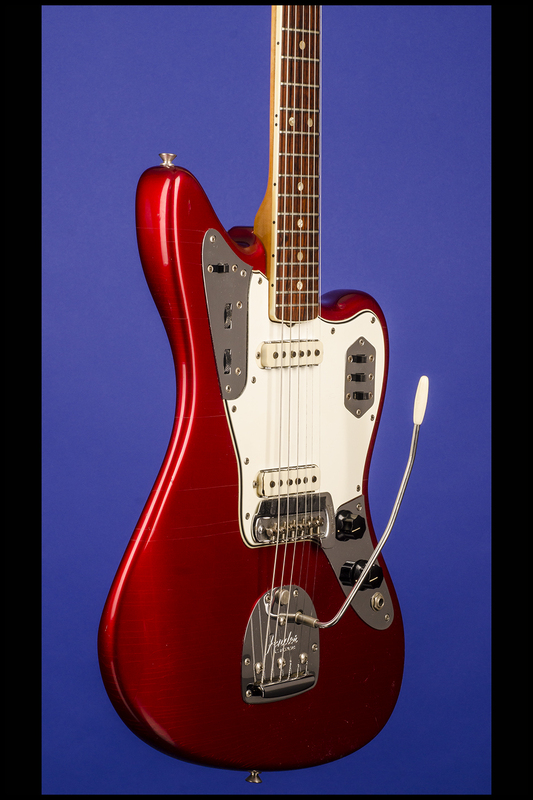 This forty-two year old, 13 3/4-inch-wide 'custom-color' Jaguar weighs just 8.40 lbs. 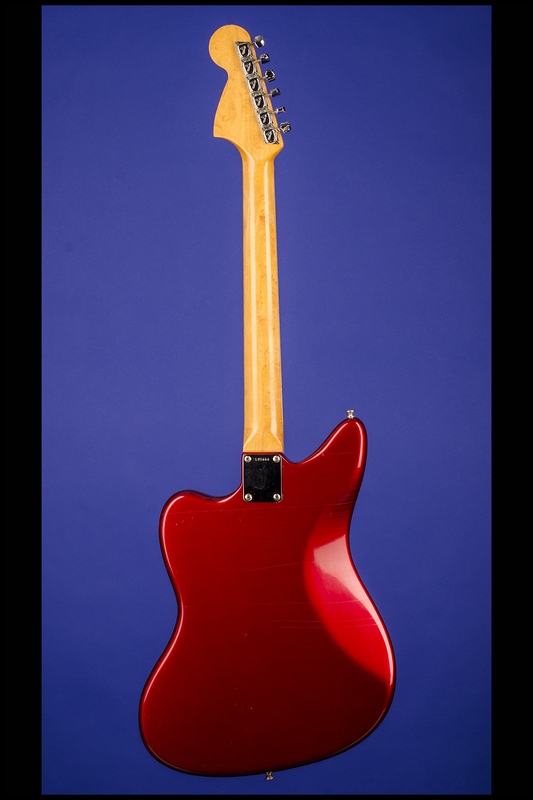 Solid alder contoured body. One-piece, sigle-bound, light birds-eye maple neck with a "B" nut width of just over 1 5/8 inches, a scale length of 24 inches and a wonderful thick profile. Single-bound curved veneer rosewood fretboard with 22 original medium frets and inlaid pearloid dot position markers. 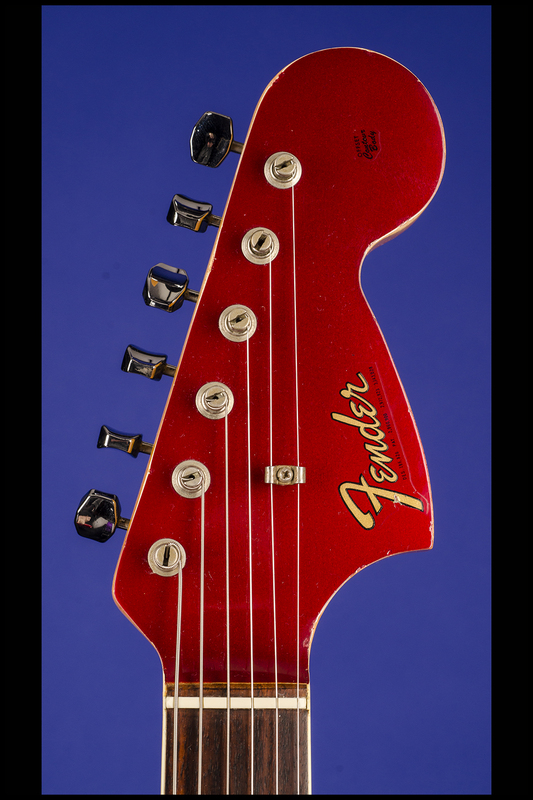 Headstock with matching "Candy Apple Red" finish and decal with "Fender" logo in gold with black trim and four patent numbers in black below. 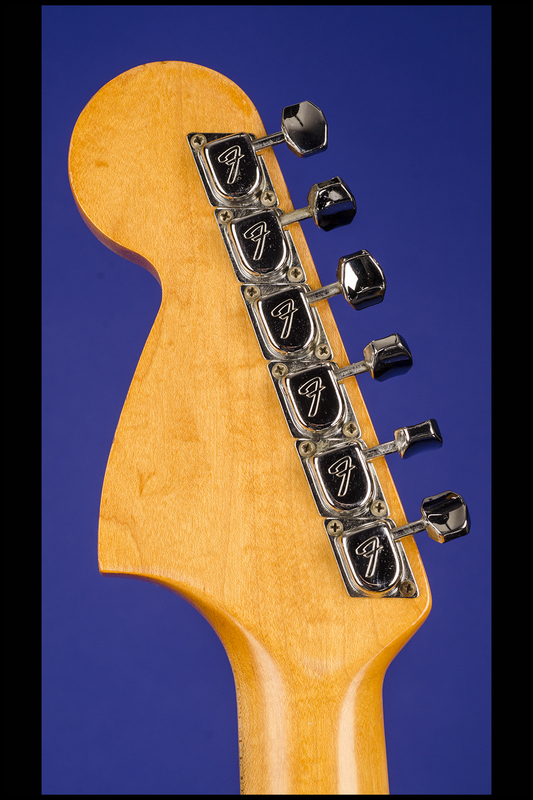 "Offset Contour Body" decal at the ball end of the headstock. Single "butterfly" string tree with nylon spacer. The neck is stamped "5 FEB 66B." Four-bolt neck plate with serial number "L95666" between the top two screws. Individual Fender "F" tuners with octagonal metal buttons. Two white oblong Strat-like pickups with notched metal side plates with outputs of 7.02k and 6.08k. Three-layer white over black plastic pickguard with ten screws. Two controls (one volume, one tone) and jack socket on lower metal plate adjoining pickguard on the treble side, circuit selector (rhythm/lead) slide switch and two roller controls (one volume, one tone) on upper metal plate adjoining pickguard on the bass side, and three pickup selector slide switches on metal plate inset into the pickguard on the treble side. The potentiometers are stamped "137 6519" (CTS, May 1965). Black plastic Jaguar knobs with white markings. Jaguar-type floating tremolo and six-saddle bridge with adjustable mute. 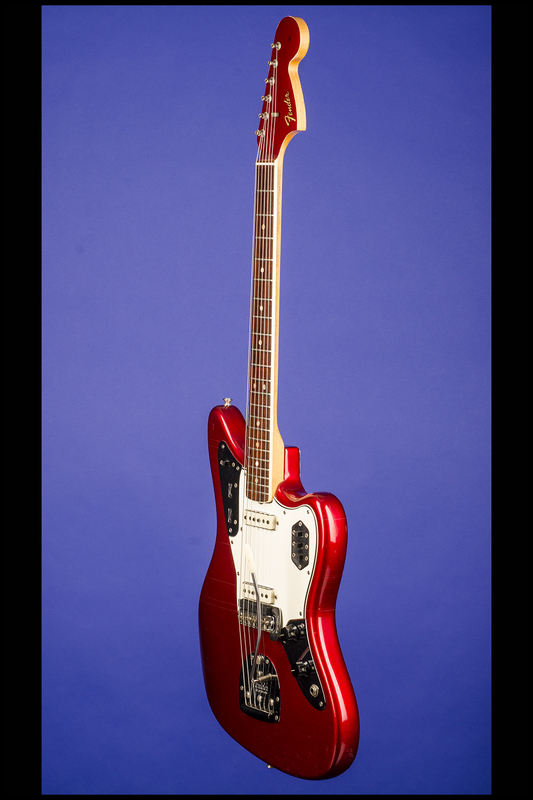 The word "Jaguar" on the headstock decal has worn away and the foam rubber mute has been renewed. This 100% original guitar (except for the replaced rubber mute pad) is in exceptionally fine (9.00++) condition. The candy apple red finish is bright and fresh and shows none of the usual fading. There is some very light finish checking and a few miniscule indentations on the body. The original frets and fretboard show almost no signs of wear. There is some slight varnish loss on the treble-side of the neck extending along the first nine frets. 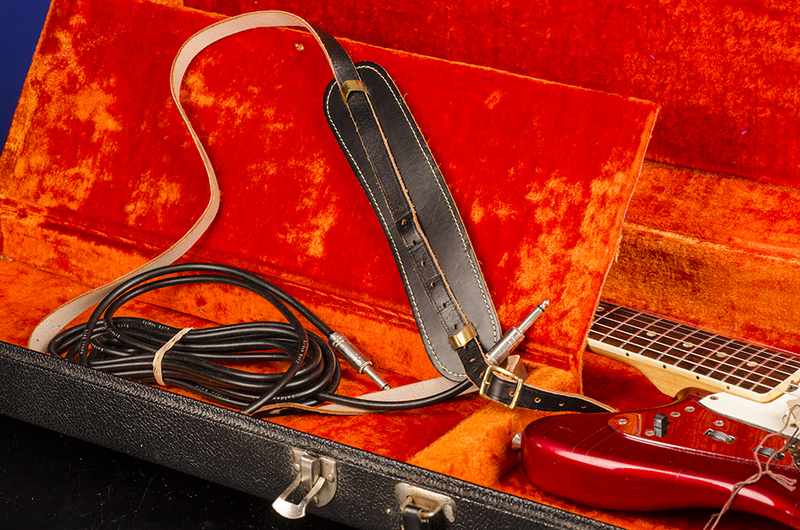 Complete with the original tremolo arm, the original black leather guitar strap, the original 12-page hang-tag instruction manual, and an early guitar cord. Housed in the original Fender three-latch rectangular black hardshell case with orange plush lining and black leather ends (9.25). 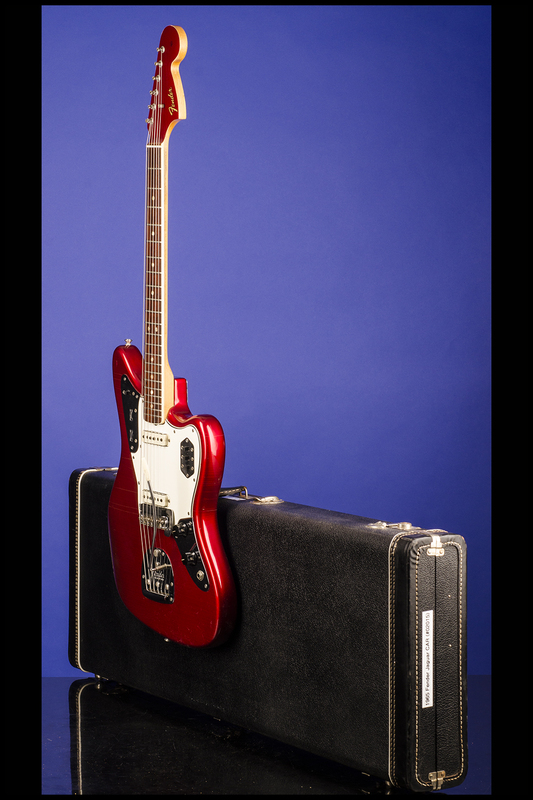 "Not content with the relatively expensive Jazzmaster, Fender introduced a new top-of-the-line model in 1962: the Jaguar. 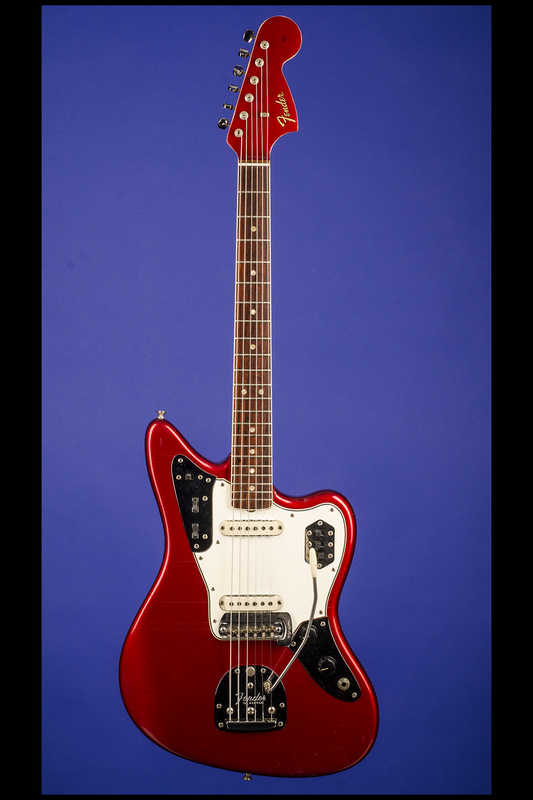 [The pricelist offered a basic Sunburst Jaguar at $379.50; a similar Jazzmaster was $349.50]. 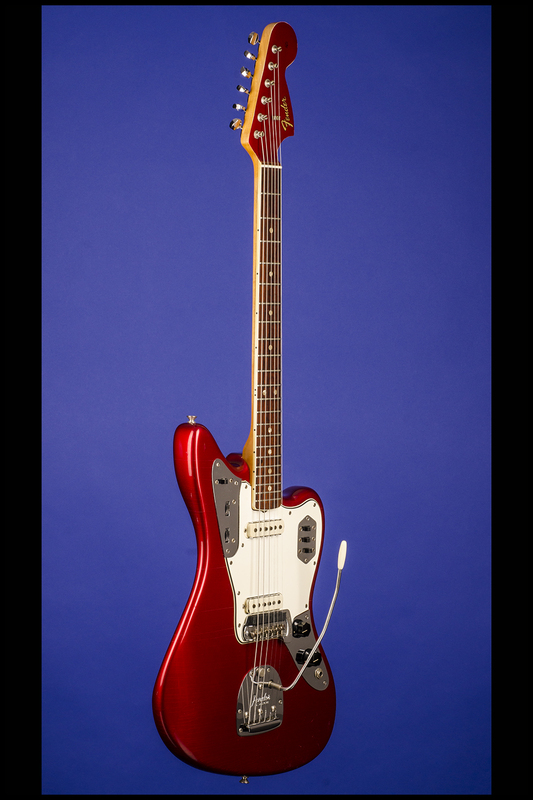 Another offset-waist multi-control instrument, the Jag seemed an attractive proposition, but still failed to dent the supremacy of Fender's dynamic duo, the Tele and the Strat...The Jag used a similar offset-waist body shape to the earlier Jazzmaster, and also shared that guitar's separate bridge and vibrato unit, although the Jaguar had the addition of a spring-loaded string mute at the bridge. Fender rather optimistically believed that players would prefer a mechanical string mute to the natural edge-of-the-hand method. They did not. 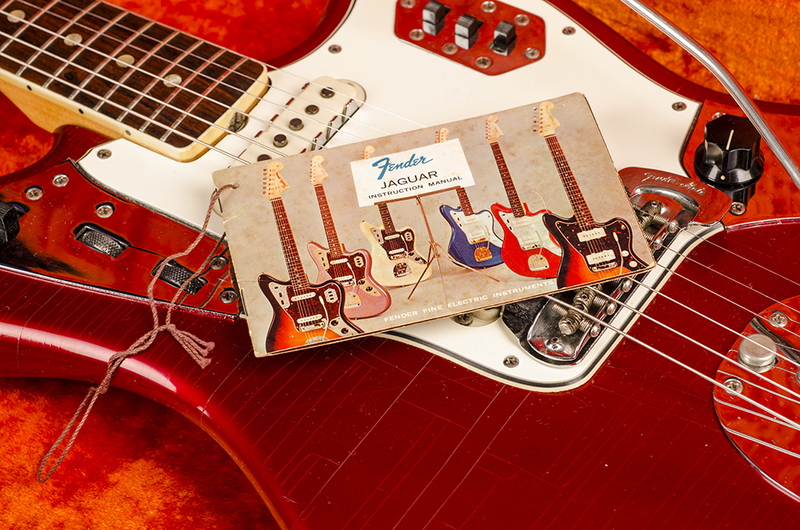 There were some notable differences between the Jaguar and Jazzmaster. 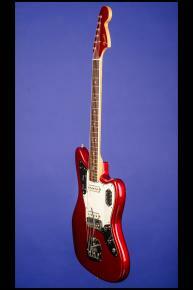 Visually, the Jag had distinctive chromed control panels, and was the first Fender with 22 frets. Its 24" (610mm) scale-length ('faster, more comfortable') was shorter than the Fender standard of 25" (635mm) and closer to that of Gibson. It gave the Jag a different playing feel compared to other Fenders. The Jaguar had better pickups than the Jazzmaster. They looked much like Strat units but had metal shielding added at the base and sides, no doubt as a response to the criticisms of the Jazzmaster's tendency to noisiness. 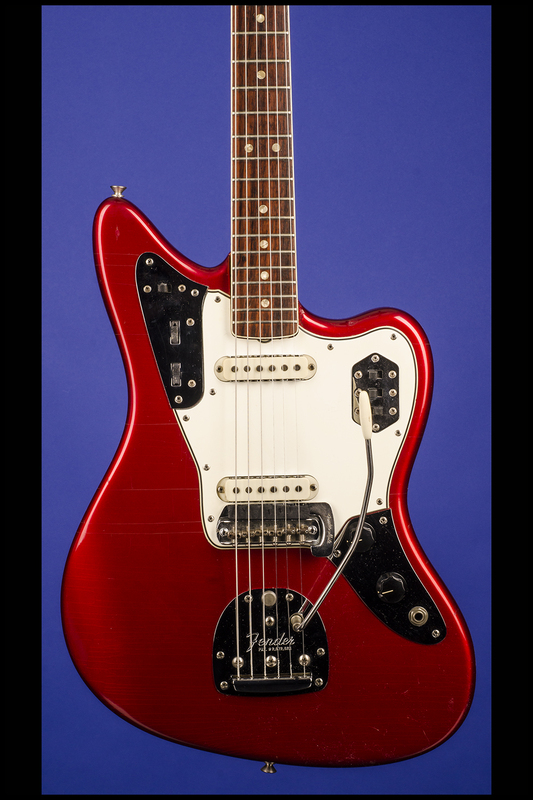 The Jag's electrics were yet more complex than the Jazzmaster's, using the same rhythm circuit but adding a trio of lead-circuit switches...The Jaguar was offered from the start in four different neck widths, one a size narrower and two wider than normal (coded A, B, C or D, from narrowest to widest, with 'normal' B the most common)" (Tony Bacon, 50 Years of Fender, p. 36). 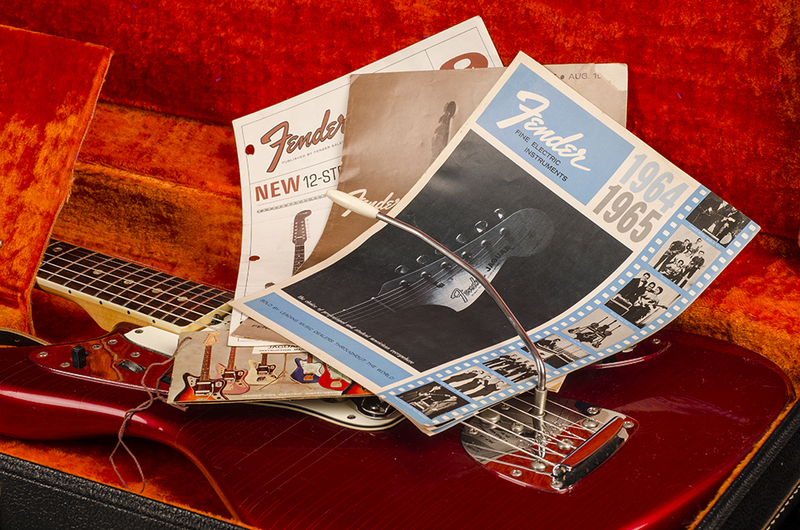 Candy Apple Red, introduced in 1963, "could be described as Fender's only true Custom Color as it was an original Fender 'mix' and not -- like most of the others -- a colour adopted from an existing automobile paint shade" (Tony Bacon and Paul Day, The Fender Book, p. 34). The undercoat on the body of this guitar is the earlier silver version, which gives a much brighter red color.